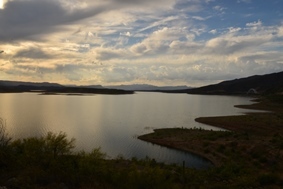 PHOENIX — To protect large fish that are targeted by tournament anglers, the Arizona Game and Fish Department has requested that the USDA Forest Service temporarily suspend angler tournaments from Apache, Canyon and Saguaro Lakes until environmental conditions improve. Golden alga blooms are not a public health threat. The toxins that golden alga produce are only harmful to gill-breathing organisms such as fish and clams. However, as a common sense precaution, dead or dying fish should not be consumed.